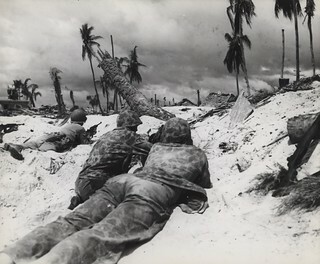 "On Tarawa Beach-Marines landing on Tarawa Island beach creep up on Jap pill boxes. The terrain of the island offered very little protective covering but these Marines made use of what little covering there was. Some of the Jap troops in pill boxes held out for two days before they surrendered or were blasted out."